Beneath the surface of a small woodland pond, it is survival of the stillest. Aquatic spotted salamander larvae are under pressure to recognize and respond to the presence of predators. They do so essentially by smell, recognizing the chemicals in the predator’s skin. When spotted salamander larvae smell a predator, they have very few options. The tiny larvae can try to hold still as long as possible, so that the movement-oriented predator won’t spot them, or they can try to avoid the predator, navigating away from the source of the chemicals that announce danger! She may not look like much. But this female Eastern newt (Notophthalmus viridescens) loves to snack on spotted salamander larvae. And, really, anything that fits in her mouth. My dissertation research explores the limits and specificity of spotted salamanders’ ability to “smell” the difference between predators using chemical cues. I collected data on behavior, swimming ability, and body shape from multiple populations of spotted salamanders to ask: what is it about geographic location that affects differences in these traits? The answer is that local pond environment seems to matter a lot. 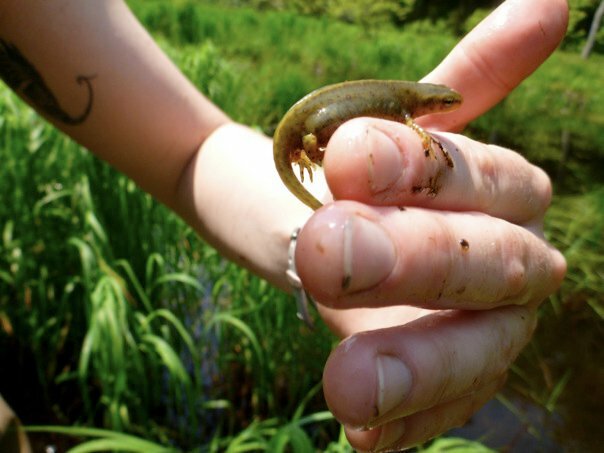 Each pond differs in what predators it contains–including adult Eastern newts, larval marbled salamanders, and invertebrates like diving beetle larvae–as well as how much competition there is from other spotted salamander larvae. Since larvae adapt differently to each type of predator or competitor, the push-and-pull of forces means that each population of spotted salamanders seems to have an idiosyncratic response to a single type of predator. With a better understanding of the ways in which predator and prey species interact, we can predict what might happen when species come in contact for the first time, perhaps as a result of climate-driven range shifts. If, as this research implies, individual prey populations are responding differently to their local communities, then it suggests a much more interesting–but also more complicated–world.